Like The Tonight Show Starring Johnny Carson: The Vault Series (6 DVD Set Collector's Edition), previously reviewed here, Time-Life's The Tonight Show Starring Johnny Carson: Johnny and Friends is a terrific set of complete Tonight Show episodes from the 1970s-‘90s, rather than a clip show of highlights, so complete in fact that these 28 full shows include all the original (network) commercials, which are sometimes fascinating all by themselves. It's another great, well chosen set, and though I've barely cracked its immense content, I'm having a grand old time watching these shows. Unlike The Vault Series, Johnny and Friends has one big problem (read on) but fortunately that doesn't effect the content at all. After Carson left the program in 1992, excerpts have turned up on places like YouTube, and there have been DVD clip show releases. And while Tonight Show episodes have turned up on "cable television" in recent years, those programs are, so I hear, heavily edited, mainly due to music licensing issues. However, the 28 shows collected here not only include all the musical guests and their complete performances (near as I can tell), but also everything else, including film clips from stars promoting their movies, network television commercials and sponsor spots featuring announcer Ed McMahon and musical director Doc Severinsen. There are even promos for then-current NBC shows and TV-movies not seen in year and years. This set includes scads of good episodes, ten discs with nearly three full shows per disc. Each disc spotlights one particular favorite guest, usually three shows in which the highlighted performer appears. They are: Don Rickles, Robin Williams, David Letterman, Jay Leno, Jerry Seinfeld, Burt Reynolds, Steve Martin, Rodney Dangerfield, Eddie Murphy, and animal expert Jim Fowler. Top-heavy with stand-up comedians, their three episodes typically show the performer's first Tonight Show appearance, one at the peak of their popularity, and one near the end of Carson's long Tonight Show run. That ordering is often really fascinating. 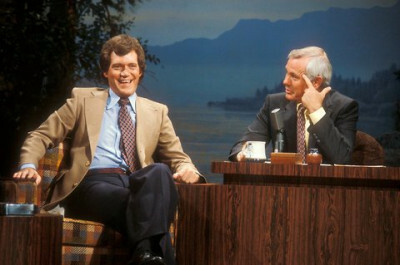 With the David Letterman shows, it's great to watch the evolution of his stand-up comedy, to hear Johnny's loud (offscreen) laughter during Letterman's performance, and Carson's immediate positive reaction to a performer he may well be seeing for the first time. The Letterman shows, also, for example, feature lots of other great guests equally fun to see: James Garner and Ellen Burstyn (promoting Sam Time, Next Year) precede Letterman's Tonight Show debut, for instance. Garner's in top form, telling several amusing stories, and when Burstyn appears, it turns out they had worked together on stage 20-odd years before and hadn't seen one another since, promoting more good stories. But you'd never even know they were there, and therein lies the set's biggest problem. Unlike the Vault Series set, nowhere on the packaging is anyone other than the eight highlighted stars mentioned. Not on the cover art, not on the discs, and there's no insert (unlike the Vault set) listing guests or airdates. Even the menu screens of the DVDs themselves are of no help. The only option is to start the show and hope for the best. Fortunately, none of the complete shows I sampled disappointed. All were loads of fun. I just wish I knew ahead of time what I was in for. The 28 shows, most running 60-75 minutes with commercials (only the local spots and station identifications are left out) are collected two or three to a disc, leaving plenty of room for occasional bonus material. Shot on (1-inch?) videotape, the shows generally look great for their age, as do the commercials, some with long-forgotten jingles and/or featuring future stars early in their careers. The mostly mono audio (The Tonight Show was one of the first stereophonic shows, beginning around 1986) is excellent though subtitle options are not included. Enormous, enormous fun for those who fondly recall the series at its peak, The Tonight Show Starring Johnny Carson: Johnny and Friends is a DVD Talk Collector Series title. If only they had listed the other guests!